Do your part to help awareness of a good cause. These charms are gorgeous keepsakes that are ideal for your own collection, and they also make thoughtful gifts for family or friends. 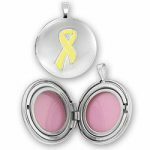 Each year, the Charm Factory donates to fundraisers and educators, and we keep prices on our awareness products as low as possible to help support those of you working to find cures and supporting those touched by cancer and other diseases. Thank you for the work you do in your communities. You want to do your part and help raise awareness to the causes closest to your heart. 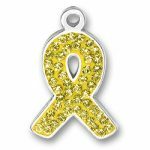 What better way to do that than through awareness ribbon charms and beads? 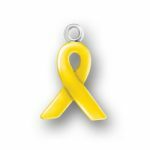 The awareness ribbons created by Charm Factory are made with durable, high-quality materials that won’t tarnish or fade. 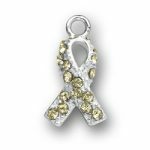 Our awareness ribbons are adorned with little crystals that come a variety of colors to represent a variety of causes. We also carry engravable awareness charms. All of Our Charms are Made in the U.S.A.! Charm Factory is proud to carry more than 5,000 high-quality sterling silver charms. All of our charms are made with.925 sterling silver and are manufactured in the United States. Each charm comes with a jump ring to attach to your bracelet. If you need a charm bracelet or necklace, we have several styles to choose from, including clasp bracelets, toggle clasp bracelets and bracelets with magnetic clasps. If you place your order before 7:30 AM MST, we will do our best to ship your order on the same day! Shipping in the USA is FREE on orders over $25. Spread awareness for the causes closest to your heart with sterling silver awareness ribbons by Charm Factory. Order your custom inspired jewelry today!